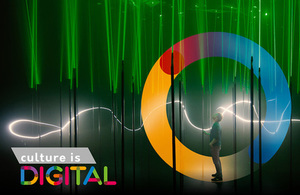 The #CultureisDigital project was informed by an online open conversation last year and was borne out of the Government’s Culture White Paper commitment to review the digitisation of our public collections and enhance the online cultural experience. In responding to these challenges, the report showcases innovative projects in the creative sector, highlighting the extraordinary collaborations between our world-leading cultural and digital pioneers and makes 12 policy commitments. Explore highlights in our 360 VR presentation.